During my MBA days, the concept of impossible trinity intrigued me. 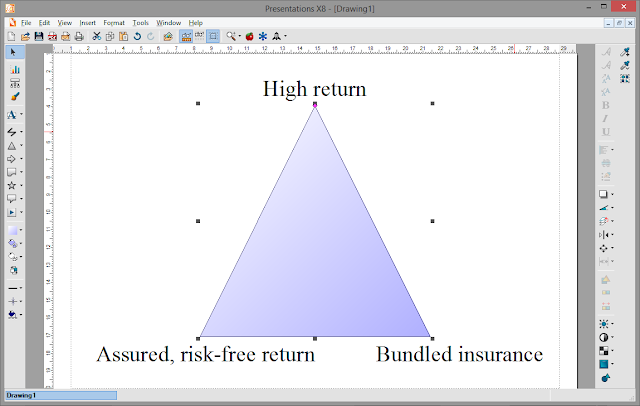 You can choose any two in the triangle, but you lose the third. Are there other similar examples? Sure. See below. A car with low fuel consumption yet high performance will be expensive. A car with high performance and low price will guzzle fuel. A car with high fuel economy and low price won't have performance. A product with high, assured return won't have insurance in it [it'll be a fixed deposit]. A product with high return and also an insurance cover won't guarantee that return [it'll be an equity market linked product]. A product with assured return and bundled insurance cover won't give high return [this is the kind of bundled product that most people mistakenly buy, not realizing that the return is lower than if they had bought individual capabilities separately]. UPDATE [5-OCT-16]: In the car example, the extreme case is also true, where you choose any one vertex of the triangle in "extreme" way, and you cannot have the other two as a result. Choose too much power, and the car would be neither cheap not efficient [think Cruze]. Desire too much efficiency, and the car would be neither cheap nor powerful [think Prius]. Choose too much cheap, and the car would be neither efficient nor powerful [think Nano].